The WCU band marches in the Rose Parade. Other related posts at roseparade.wcu.edu include a collection of comments from band members and fans about the parade, videos of band director Bob Buckner and Chancellor John W. Bardo speaking to the band after the parade as well as a video of a drummer giving his drumsticks to a parade-goer, and slideshows of the band taken from a media stand on the parade route and the warm reception the members received upon their arrival back at the hotel. Later on Jan. 1, the band celebrated the year at a more than 4-hour band banquet. Members gave speeches expressing thanks to all who made the year possible and special thanks was offered to director Bob Buckner, who plans to retire in the spring. The evening included presentations from formal awards to less-formal awards, including gold-painted paintbrushes “inscribed” with “You paint the fields of our hearts” presented to volunteers who helped paint the lines on the practice field. Many expressed gratitude to Chancellor John W. Bardo for his support of the band and helping it grow, including his role in changing the group’s name from the Marching Cats to the Pride of the Mountains Marching Band. “He changed our world,” said Buckner. 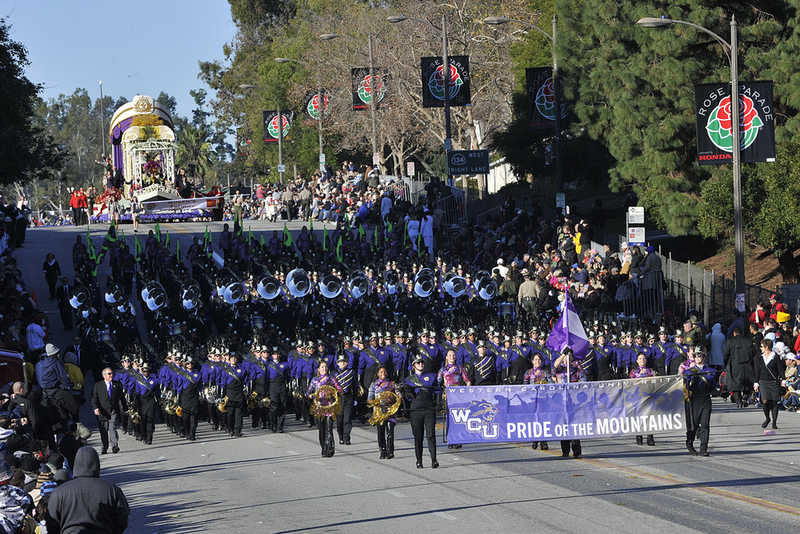 The band will enjoy Disneyland on Jan. 2 before begin travels back to North Carolina.